The event was hosted by the Embassy of India in Washington, DC, and Georgetown University’s India Initiative. Music heals, it has been said, especially when sung with devotion and heard with attention. Classical music, whether it is Indian or Western, has even more power to heal. On the evening of September 16, the Lohrfink Auditorium on the Georgetown University campus in Washington, DC, witnessed one such performance where music’s healing power was in full display. The performer in question was Indian Sufi musician Zila Khan, whose captivating voice enthralled some 300 Washingtonians. The occasion was a concert, hosted by the Embassy of India in Washington, DC, and Georgetown University’s India Initiative, as part of the “India @70” celebrations. Khan, who sings classical and semi-classical musical forms and performs in the tradition of the Imdadkhani Gharana, won hearts of the audience, with her intense singing skills and splendid stage presence. 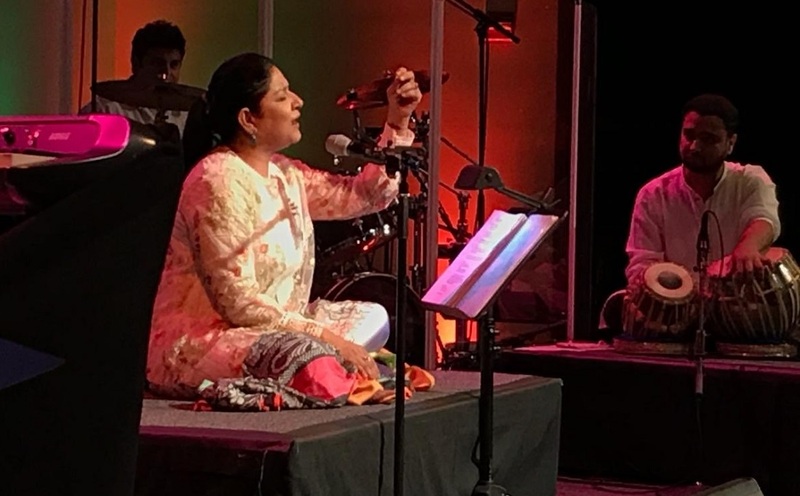 Alka Batra, a long time Washingtonian, called the concert an “uplifting experience.” An “evening of pure joy,” said Arvind Krishna, a resident of northern Virginia. “Music has no language and the Indian classical music with its ragas are made to heighten the mood,” added Moazzam Siddiqui. Khan, daughter of sitar maestro Ustad Vilayat Khan, started with a Sufi invocation and then sang shayary of Amir Khusro, a 13th century mystic poet and musician from India. She also complied to request from the audience, with such popular compositions as Aaj jane ki zid na karo and Chap Tilak. During the performance, she explained some beats (tala) and some notes of the ragas. After the invocation of Devi (Goddess), she requested the lights to be turned off. Khan said that the prayer to Goddess was very close to her heart as she gets a lot of strength from that. “It was also for women to see their own strength,” she added. Khan, who learned formal lessons of music from her father for many years, has sung playback for Bollywood films. She has also acted in films — most notably in Sanjay Leela Bhansali’s Bajirao Mastani — theatrical plays. She also produced and directed a documentary, Spirit To Soul, on her father.